its ancient wood and traditional slate walls. 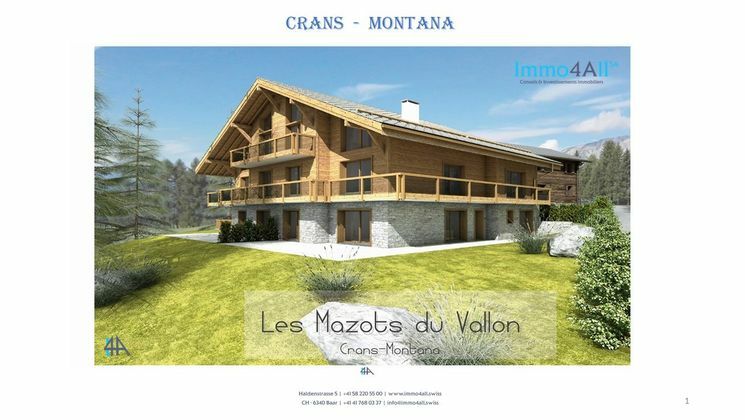 "Les Mazots du Vallon" is the result of a subtle andrefined combination between traditional charm and modern comfort. Initially built for agriculture, a mazot is a typical construction of The Valais, caracterized by its hundred year old pegged wood, it was used to store the harvests of the pastures. Today, the residence "Les Mazots du Vallon" reveals the magic of these chalets from another time. With world-class golf and alpine skiing, Crans-Montana has been cultivating its prestige and reputation for more than 50 years. Perched on the sunniest hillside in the valley, this mountain . sets on a high plateau in the very heart of the Alps and extends to the eternal snows of the Plaine-Morte glacier at 3'000 meters. At the crossroads of the Alps, Crans-Montana can be easily accessed by car from different international airports. Located in the very center of the resort, a couple of footsteps only from the golf course and the ski slopes, the residence is ideally placed to fully enjoy the village and all its activities. Facing south, established on a 3'000 sqm land, the complex consists of a modern chalet connected by a glassed footbridge to a traditional mazot converted to a wellness area, called "Privilege"
Sheltered by two majectic pines, the residential chalet comprises four beautiful modern apartments including two which are duplex. At the same time strong and balanced, the design is an invitation to the pleasures of modernity while respecting the traditions and wisdom of the past.